Just arrived back from another successful 2-day Tribology event at one of the IET main event hubs, Austin Court in Birmingham. Across the 2 days, there were eleven technical presentations by industry experts. 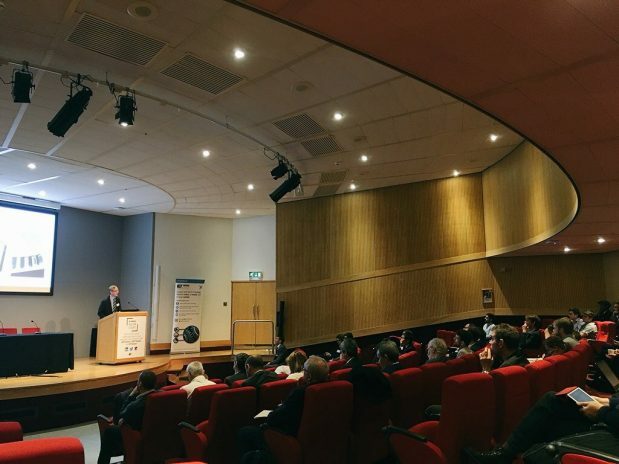 Day 1 kicked off with the IET Tribology and conference chair, Dr Rich Baker welcoming the audience and speakers and recounting some of the highlights of the 2017 event and then we moved on to the first invited speaker, Dr Chris Warrens from BP. Chris spoke of the drive for improving fuel economy and how this can be partly achieved by tailoring the automotive lubricant in the engine. This was followed by Professor Hugh Spikes, from the Tribology group at Imperial College, London who spoke about the effect of stress augmented thermal activations in fluid systems. After a short break, Professor Kai Cheng from Brunel university showed how simulations can help predict tool wear in precision machining in the aerospace industry – with examples of 2 different industrial projects he has been working on recently. Following on from this was the poster presentation quick fire round, where each of the poster presenters had a 3-minute slot on the main stage to promote their posters to the audience before we broke for lunch and to review the posters and sponsors who were exhibiting this year. After lunch, Professor Susanne Norgren from Sandvik in Sweden, presented some fantastic work on the current research and challenges they are facing with replacing the Cobalt binder in rock cutting and machine cutting tools. This was followed by Dr Tian Weixue from Caterpillar in the US who was refreshingly honest about the current tribological gaps in knowledge that Caterpillar are facing and how they are going about trying to solve these with collaboration with academic research institutions. 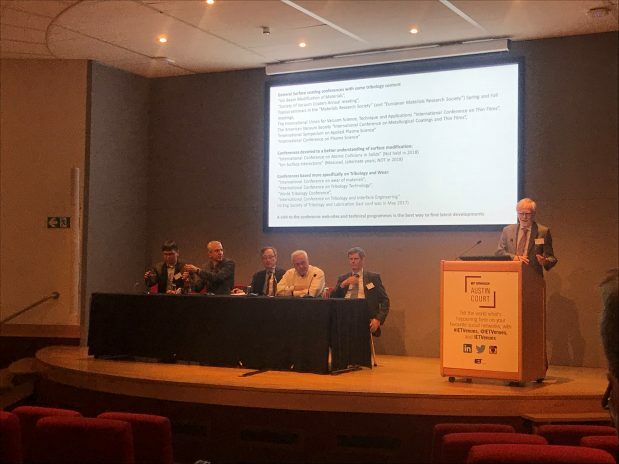 After a short coffee break, the speakers came together as a panel to discuss the current challenges, and opportunities in Tribology and how both academia and industry could work better together to help identify the problems and offer solutions. Following the panel discussion was the poster prize that went to Rachel Januszewski from imperial College for her poster on visualisation of the false brinelling and the closing remarks before we all de camped to have some very good networking opportunities at the local pub just across the canal from Austin Court. Day 2 was chaired by Professor John Colligon with the main focus being on tribological coatings. Professor Paul Mayrhofer from the Technical University of Vienna opened the presentations with the importance of mating the correct materials together for the correct applications before Dr Jeff Rao from Cranfield University showed us some smart nanocomposite coating techniques that have been used to help lengthen tool durability. After a coffee break, Dr Andrew Jardine gave a presentation on the challenges facing measuring diamond tool wear and showed a new instrument that they are using at Cambridge to help characterise the wear rate of different diamond structures. The 2nd day 3-minute poster presentations followed this before breaking for lunch. After lunch Dr Nishil Malde from Anton Paar gave an interesting talk on the challenges of finding the correct test conditions, speeds, loads and lubricants for testing different contact lenses, before Professor Arutiun Ehiasarian from Sheffield Hallam University explained the challenges of creating corrosion resistance alloys for extreme operational conditions. Professor Mark Gee then gave a visual insight into real time wear of materials with some very clever techniques that have been developed at the National Physical Laboratory over the past few years. After another very interesting panel discussion on the future of existing materials and their potential replacements, Rich Baker closed the conference out announcing Tim Kamps from Southampton University had won that day’s poster competition and wishing everyone safe travels home.